Babylonia Flexia - use from newborn to 3 years, without the need for any accessories or inserts. The Babylonia Flexia is a fabulous carrier that can be used from newborn to 3 years of age. There is no need for any extra inserts, cinchers, or panel adjustment. 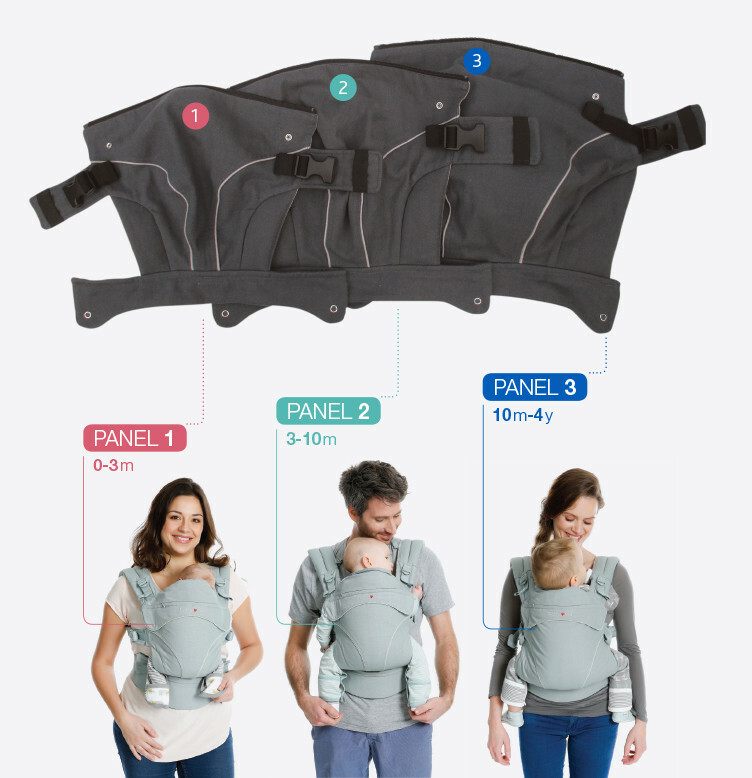 The carrier comes with 3 different panels, and each panel can be easily changed with zippers, depending upon the age / size of your baby. This allows the carrier to grow with your child from newborn all the way to toddlerhood - we say around 3 years. Babylonia Flexia is an ergonomic carrier. What does this mean? Due to its innovative design, the baby is always seated in the best possible position for them at every stage, with their knees higher than their bottom (imagine a capital 'M') and the back is perfectly supported while the natural curvature is respected (imagine a capital 'J", where the hook of the J sits right behind baby's knee pit, down their bottom, and curves up their back to the nape of their neck). The shoulder straps are extra-soft and moldable. The waist belt is padded, and the carrier is made from soft, breathable organic cotton - kind to yours and baby's skin, and planet friendly too! Babylonia Flexia is made to faitrade standards from Oeko-tex certified organic cotton, keeping toxic chemicals away from baby’s sensitive skin as well as being earth-friendly. Machine wash cold. Do not tumble dry. Do not bleach. Do not iron. Do not dry clean.